30-October-2011. Finally the big day arrived, we got up round 6 in the morning and packed our stuff. We didn't do that before because we thought we might forget something. @09:40 our neighbors came to say goodbye, and walked with us to the train-station. Our destination Koh Kood. We'll reach that by first going to Amsterdam Airport (Schiphol). From there we took a plane to Bangkok, with a stopover in Cairo. On the moment we're half way the trip from Cairo to Bangkok. There's an amazing annoying kid running up and down the aisle. Darn I've been thinking of tripping the little bugger, but then she would scream her little bugger head of. We're experiencing quite some turbulence but Ira manages to sleep right through it. Which I think it's amazing. Dutch time is 02:35. My watch is already on Thai time (08:35). 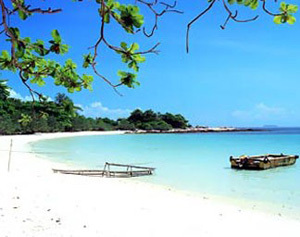 We're really looking forward to arrive on the island but first we're gonna have a transfer flight from Bangkok to Trat (south-east, close to the Cambodian border.) In Trat, if everything goes to plan, we'll be picked up & go to the hostel. We did arrange that from home, incl payment. The rest of the trip we'll see, but this we did book in advance. 31-October-2011 We landed in BK. We didn't notice any floods at the airport, that felt good. It was + 33C outside, which we didn't mind! 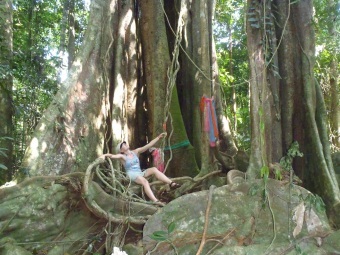 Iryna saw beautiful tropical plants outside and than she realized we are finally in Asia! On our way to find an ATM and a SIM card for the phone we saw a women behind the counter real busy with her make-up. It looked real funny, instead trying to sell something she was making her morning make-up! In Cairo we've met a nice guy from Belgium/Portugal Enriquo. He was going for a 3 weeks vacation in Thailand/Malay and Singapore. So at the BK airport we said goodbye to each other and exchanged our emails. From there on we took a flight to Trat. We arrived at 18:30 at the Trat airport. Iryna's found it strange that at 18:00 it begins to get dark in Asia and at 18:30 it's real dark. We were picked up from the airport by nice for-weal drive. While sitting at the back of the car we could actually 'smell' Thailand, that was great!!! It was quite a ride to the guesthouse. When arrived there we had a nice shower, had a chitchat with the owner and went to take off some money for the rest 2 weeks as at Koh Kood they don't have any ATM's. On our way back we eat some tasty Thai food for E 1,5 each and had some Thai beer for 50 Bath. Time flies when u having fun! 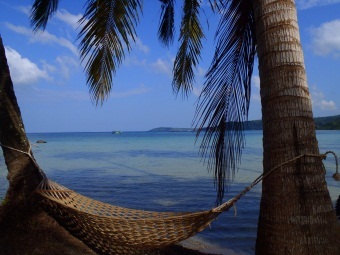 Its almost 2 weeks since we're on the Koh Kood island! We're staying at Ngamkho resort. The people working here are very friendly and willing to help. We have met interesting people at this resort, with some we still keep in touch. Also on the 10th of November we had some celebration with Thai people. 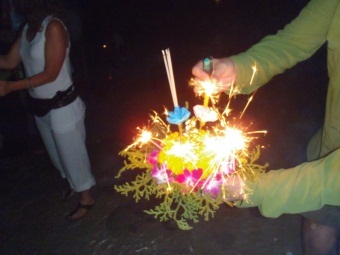 It's called Loi Krathong. People celebrate it on the night of full moon in November. From banana leaves they make some flower figures and in the evening after the sundown they put them in the river. In this way people want to thank the river for giving them all goods and saying sorry for polishing the water etc..This tradition goes hundreds of years back in time. When Thai tribes settled down the river side to fish, cook etc....they made a living out of it. In Chang Mai this festival is mostly celebrated. People throw hot-air balloons in the air and lit fireworks. Ok, that's it for now. Our plans have changed a little bit. On Wednesday we are heading back to Trat, want to arrange there a motorbike and head off for Bangkok (as we need a visa for Vietnam). From there on we want to go to Chang Mai and explore the rest of North Thailand. Greetings and see ya next time! Our plans are still changing....we found out that we should arrange some papers for the bike in Bangkok. So we don't stay at Trat but go right away with a bus to Bangkok. Luckily Anita (the German girl we have met at the resort 2 weeks ago) is already there and she arranged a room for us, so we don't have to find out where we gonna sleep the coming days. We will try to stay as less as possible in BK and move on to Chang Mai. Here we r again:) We r doing fine over here in warm Thailand. At the moment we stay at Sa Kaeo, some 60km from Cambodia. We've decided to stay at this place 3 nights to have some rest and get a small lorry fixed for our bike. For so far we've managed to buy a bike and traveled with it some 450km. The first day driving we got a bit of a saddle ache :(. But now our gentle bum is used to some shaking and rubbing :). It's great to be on the road again!!! It's just freedom, now we have the possibility to stop where we want to and drive less traveled roads. The last couple of days we've seen and experienced some great things. Thais people are so friendly, for example we had a stop somewhere in the village to have a rest, all of a sudden someone showed up and offered us a bottle of water. Or we bought a cup of latee and sat ourselves down near the shop, after some time we were offered 2 glasses of cold water....it's just a small detail but it felt good, we felt welcome! Thai people, they make time for u, they just stop for a chit chat, they greet u friendly and of course smile at u. Thailand is really the land of smiles!!! Nature is awesome! We've seen some nice beaches, untouched mountains, it was great to drive and out of the blue to see a huge set of rocks showing up in a distance! Also endless roads of plantations and rice fields. The vehicles they drive are awesome! How they ever came up with the idea to construct something like that??!! It has just 2 wheels, something to sit on, something to store a huge amount of food or whatever that can be and something that looks like a motor.... A Tuk tuk doesn't even come close to it!!! By the way, we were surprised how good the roads in Thailand are! Even the less traveled roads are from good quality! We also had some adventure with a monkey! We had a stop near something that looked like a nature resort. We put our bike on a side of the road and were just 3 steps away from it. In the park we saw a few monkeys. All of a sudden a monkey showed up by the bike and wanted to steal something from our bag! Goofy took that bag away and was watching what that monkey gonna do next. She wasn't scared at all, she came up closer to the bike and picked our sun cream! In no time she was sitting high on a tree and laughing at us! After taking a few bites on our tasty cream she threw it back to us. A bottle of cream wasn't enough for her, she came up closer and was sitting on the tree. We tried to scare her away but she decided to scare us instead! She jumped on a branch above our head that it almost hit us! On that right moment I thought I would rather leave this place and so we did! Next time we gonna be more careful with these bastards! How about eating.... Iryna says it's not my sort of food and for Goofy it can't be better! We knew that Thais meals are quite spicy, but it also has some special ingredients like lemon grass, coriander and curry.....They also have different sorts of snack, deep fried chicken, pork, fish, sausages and tasty fried banana's mmmmm. U can buy coke cola everywhere, even in out of the way shop. As well as shakes, they blend some ice cubes with any tropical fruit or coffee or whatever u like and u have a perfect shake. If u want to order a hot cup of tea or coffee u have to specify HOT otherwise u get a standard big cup of coffee with ice cubes. By the way which is delicious, but sometimes it's a pleasure to drink some fresh coffee/tea. We eat just where the locals eat and until now we haven't had any problems with it. Also ice cubes are just good. Nowadays these ice cubes are made only from a drinking water, so u shouldn't have any problems with it anymore. Ow before I forget, while traveling from Bangkok to Cambodia we stopped in a little place where we asked in some official building for a hotel/motel. 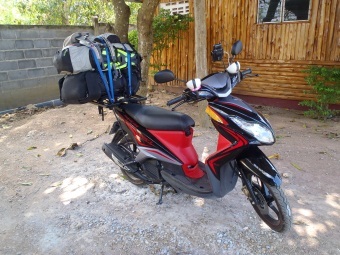 After we were shown the way by a friendly local who drove in front of us to the hotel we unpacked & GoofY decided to fill up the motorcycle for the next day. 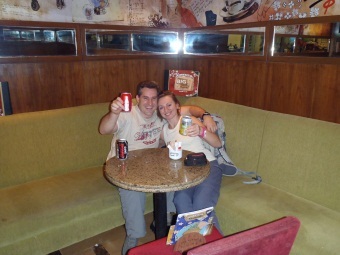 While doing so he met a couple we've seen on the boat in Koh Kood, the guy (Adam) is an Australian & his wife (Sue) a Thai. Of course we were quite surprised & decided to have a drink in the evening. It turned out really nice so we stayed another day. The next day GoofY & Adam worked on the motorcycle to install a 12 V car lighter socket so we can charge anything we want while on the way. Ok, that is it for now, see ya later!